Though this online project ended on January 1, 2016, I'm happy to announce that it has led to the creation of a print anthology. Grayson Books will publish Poetry of Presence: An Anthology of Mindfulness Poems in late summer, 2017. Edited with my friend and colleague Ruby R. Wilson, this book grew directly out of A Year of Being Here and wouldn't have happened without the support and encouragement of this blog's subscribers, to whom I'll always be grateful. I invite you to join the Poetry of Presence email list at this link. 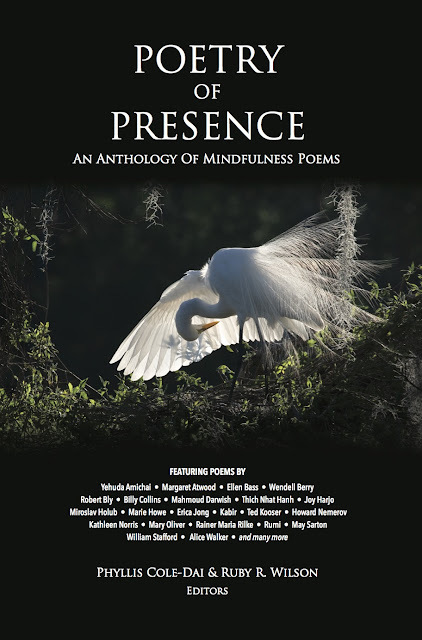 As our gift for signing up, you'll receive a mindfulness poem, accompanied by "Great Egret Bow," the fabulous cover photograph by David Moynahan. We'll send you occasional news about the anthology, including notification of its official release. A Year of Being Here will remain online indefinitely for your browsing enjoyment.